I need to create a tree-view which allows users to select nodes (using a checkbox). 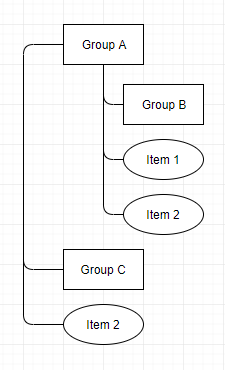 The tree-view contains two types of node, "group" and "item". A "group" node can contain both "group" and "item" nodes. An item node can't contain other nodes. Crucially selecting a group node should automatically select all node below it (to the bottom of the tree). However, due to this last criteria I can't figure out the following behaviour (I make reference to the attached diagram). Now Group A, Group B, Item 1 and Item 2 are now checked. What should the state of Group A be (checked, unchecked or indeterminate)? The latter answer is generally used in the tree view on MS based products. We ended up solving this problem by adding a new node to each group node that had children of both group and item node types. For example, "Group A" would have an additional node called "Group A items" added to it. This node was purely presentational and didn't exist in our backend, when this fake node was clicked it would select the children item nodes for "Group A". This allowed us to use the indeterminate state of "Group A". Not the answer you're looking for? Browse other questions tagged checkboxes tree .